Start the New Year Right with a free No Cheat Challenge! Be honest – did you eat well over the holidays? I didn't. I DEFINITELY didn't. I didn't mean to go so far off track, but it started with my daughter making chocolate chip cookies and begging me to try one and it went downhill from there. Fortunately, I have a plan! I've done this before. Over the past several years of being a Trim Healthy Mama, I've had excellent holiday seasons where I've stayed 100% on plan, and not-so-great holiday seasons where I've derailed badly. I may have gained a pound or two, but thanks to the Trim Healthy Mama book I can easily get rid of it. I know exactly what I need to do to really start over. Armed with knowledge and experience, I'm going to be starting off 2017 with a healthy challenge to myself (and to you! ): eat on-plan, at home, for 2 weeks. Just two weeks! It's do-able, and it will feel so good to eat healthy foods that nourish our bodies! And I won't leave you hanging – this is about eating well for LIFE, not just two weeks, so the tips I'll share will keep you going all year. I'd love for you to join me in this challenge! All you have to do is sign up, and I'll share my meal plans, shopping lists, and a bunch of tips from experienced Trim Healthy Mamas to keep us doing well. These meal plans are made with recipes from all of my favorite THM bloggers, and the goal here is to eat so well that we won't feel deprived at all! We'll eat our healthy meals and desserts and enjoy every bite! Sign up below to get started! After you confirm, you'll get your first email with the menu and shopping list. I'm looking forward to doing this together! Free Meal Plans, Shopping Lists, and Support to help you meet your goals. This challenge is gluten-free and sugar-free, and even works for THM! Don't miss out! Success! Now check your email to confirm your participation. 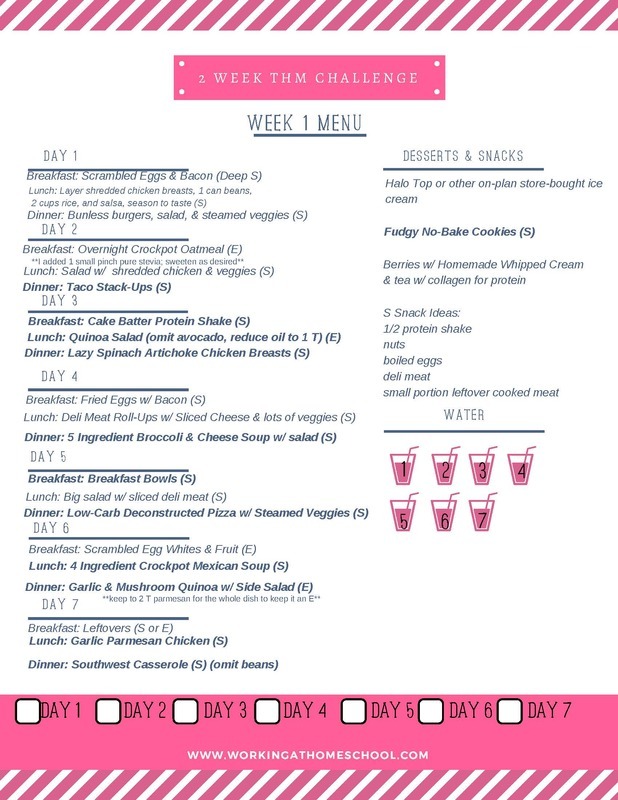 Please keep an eye out for your free shopping list and menu for week one! You'll receive tips and ideas to keep you motivated throughout the two week challenge! Love this idea! Unfortunately I entered my email address incorrectly and can’t find a way to resubmit. Can you please tell me how to resubmit? Thanks! I went way off plan and need your help with menu to get back onplan!! Thank you so very much!! I’m excited about your book…is it full of gluten free options? Yes, it’s all gluten-free. There are a few recipes that recommend tortillas, so the book explains how I usually just stack those recipes up into a bowl, because store-bought gluten-free tortillas aren’t on plan. Will it be dairy free friendly as well? Hi Larissa! The two week menu has some dairy, but I’ve skipped the cheese and dairy on the recipes (even the Bacon Swiss Chicken) and I still really liked them. For the few recipes that call for dairy, you could always just swap out that meal for something else that your family likes. thanks for posting this! I derailed well before Christmas so i have gained back everything lost plus more. Im looking for an encouraging simple plan so thanks again! I am so excited to do this challenge! I am getting organized today, and ran into one little snag. In the pdf, when I click on the recipe for the Chicken and Brown Rice soup it still connects me with the Mexican Quinoa dish above it. Would you be able to send the link for the soup? Thank you so much!!!! Hi! I signed up and got the three emails about the challenge. But there was a problem with the email and my phone kept flashing a pop up constantly. Finally I was able to delete the emails and tried to move them back to my inbox but they vanished. Can you somehow send them to me again? Thanks! Wow,that’s weird, I’m sorry! I’ll forward them over. Hi! I am so excited to be signed up for this! I’ve been debating wether or not to try THM, I’ve read both books cover to cover but could never quite commit, so I think this will be just the push I needed. Looking forward to doing my best! Hi Joanne! I’m so excited you’re getting started with THM! I hope you love it. Remember, though, that this menu does start with two Deep S days, which is more recommended for if you’ve been on the plan and gotten off-track. It might be a little hard to get used to if you’re just getting started. I hope you get some good ideas from the menu! I really have received the meal plan for week one. Is there anyway that I can the week 2 shopping list? I live about 90 miles from a good grocery store and am going today so would like to get everything I need! Oh my goodness, Kari, I feel so awful, I wish I could! I had two big problems with recipe links so I’ve had to replace those recipes and totally change the shopping lists. I’m working as fast as I can, though, and I hope to have the new printables available very soon! Hi Dawn! Sorry, I’m not sure why that would happen! I’ll double-check to make sure it’s right. Thanks for letting me know! Hi, I’ve been loving your meal planning guide! You’ve done the hard work and made it easy on me, thank you. Monika, thanks so much for taking the time to post your comment! It’s so nice of you to say thanks; I’m so glad you found it useful! Hi Joyce! I created everything on my mac, so it should be fine. I’m not sure what that line means, I’m sorry. Did you try again? I haven’t gotten Week 2 meal plan yet. Did I do something wrong? I keep waiting for it!. Am I missing it? Hi Hannah! I just checked the email for week two, and it looks like it was sent to you. I’ll send another copy over now; I’m sorry you didn’t get it!